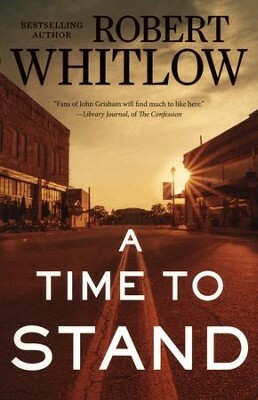 I have enjoyed some of Robert Whitlow's previous writing, so I was happy to have the chance to read and review A Time to Stand. I also thought the story of this book sounded interesting. This book tells of a young African American attorney who finds it hard to know where she stands as she comes across a case of a Caucasian police officer who has shot an African American teen. This is a story of community, family, and love. This is a book that will be of interest to those who are interested in the law and the work of lawyers, and also those just looking for a decent story. It is easy to get to know the characters in this book and feel for them. This book kept me interested as I was reading it. There was something about the ending of the book that really left me feeling disappointed. This book just was not all I wanted it to be when it comes to the topics it was tackling. Overall, I thought that this was a decent read but nothing too great. I give A Time to Stand 4 out of 5 stars.